Elizabeth and I got a babysitter, drove to Scottsdale, and saw The Artist at Harkins Camelview today. The Artist is one of those movies that’s on every critic’s top 10 list of the year’s best. Based on the effusive praise, I sweet-talked Elizabeth into seeing it instead of the Robert Downey Sherlock Holmes sequel. I don’t know if it was a great movie; in other words, I question how much I was affected by the story the movie told, but one thing is for certain: it was definitely an experience, and we were both glad we went. 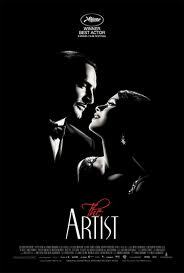 The thing about The Artist that you need to know going in is that it is a silent movie. A real silent movie. I guess I didn’t read the reviews carefully enough, or maybe the surprise is supposed to be part of the film’s charm, and so the critics purposely are concealing the fact, but neither of us knew this at the outset. I did know that The Artist is a movie about silent movies; I just sort of assumed it would take the Singin’ in the Rain approach and be a movie about silent movies without being silent itself. Perhaps the studio and critics alike were afraid that being straightforward on this count would only scare audiences away. However, we both felt that knowing this up front might have saved us a great deal of needless distraction (and honestly, impatience bordering on irritation) early in the film while we were sitting there wondering how long things are going to go along in silent movie mode before they inevitably went back to normal. Or maybe it wouldn’t have mattered. Besides, the fact that this truly is a silent movie is exactly the reason why I want to encourage people to see this film, and to see it in a theater with an audience, and not to wait for it on DVD. When you watch this movie in a theater with an audience, you become aware of the power of silence in film in a way that you can’t appreciate when you’re at home by yourself. The silence is the main character in this film; it influences everything that happens onscreen, and even what happens in the audience. Watching this movie makes you aware of every piece of popcorn you put in your mouth, because you hear it as you chew, and you know people around you can hear it, too. You become much more cognizant of how much noise moving the popcorn bag makes, or even lifting and setting down your drink, or scratching your nose. I have the definite feeling that a lot of popcorn went uneaten because people were afraid of making too much noise during the film. That wasn’t a problem for me in particular, because I had eaten almost all of mine during the commercials and the trailers. I don’t think Elizabeth ate more than a quarter of hers. Of course, the movie had a soundtrack, or more properly, a score, so there was music throughout. But it’s amazing that a movie can have a full musical score, and still have so much silence in it. I guess it’s similar to the way a solar system can have all these planets, some of them giant-sized, and yet still have so much empty space. Modern audiences are used to being inundated by sound at the movies. In fact, we’re so used to noise that the lack of it swiftly makes us uncomfortable. That’s how Elizabeth and I felt through the first third of The Artist. As movie-goers, we are so accustomed to sound as a constant companion that silence lasting longer than a pregnant pause is seriously distracting. Think about it. When is the last time you were at a movie, and refrained from eating your popcorn because you were worried about bothering those around you? It does happen, but those moments are rare, and they are ultimately just that…moments. When was the last time you were in a theater, and you felt certain that you would hear it if anyone anywhere in the auditorium passed gas? I can tell you, no foul aromas came wafting by our seats during this movie. So, at first it was discomfitingly quiet. Deprived of a full-on soundtrack, you can only focus on how quiet it is around the music, and you wonder just how long this can possibly go on. At some point, you realize that you’re in it for the long haul; and then some time after that, you give in to the silence. Your mind begins adapting to it, and transfers your attention away from listening to how quiet it is, to really watching what’s happening. Without the sounds of dialogue, and background noise, and effects, you find that you’re tuning in much more closely to the facial expressions of the actors, the body gestures, the movement, all the visual information on the screen. Without colors to distract you, (oh, did I need to tell you that The Artist is not only a silent movie, but black and white as well?) the visual details are the only sources of information available to you, and so your mind becomes engrossed in them. Then something truly interesting happens. The movie starts to slow down, or more aptly I think, open up. I’m guessing it’s an effect of sensory deprivation, of not being distracted by the noise and the color, but you start to feel this sense of expansion, of open space, of extra room in your mind, and the time, to explore the things that you are seeing, the characters, the places, objects, details. Instead of being shellacked by the soundtrack, and mauled by the maelstrom of color, you discover an abundance of time and space exists, and a peaceful curiosity is allowed to blossom. If watching a typical movie is like trying to follow a single person in a crowded, loud, cacophonic train station, watching The Artist is like a leisurely stroll with a knowledgeable guide through a quiet art gallery. And for that reason, The Artist is more about an experience than it is a movie, at least to me. I’m not saying that I want to see more movies made like this, and I’m certainly not arguing for a renaissance in silent movie-making; this movie’s experience was so effective because it exists in opposition to what we expect from a movie. If you change those expectations, it changes the effectiveness of the experience. I think most stories benefit from the use of color and sound, but this movie had to be made this way, because the silence is integral to it. The thing is, I don’t know how much of this experience will translate when watching this movie at home. Most homes aren’t capable of filling a soundproof and lightproof room with a single, wall-sized image; and besides, home brings it own set of distractions. That’s why I want to encourage people to see this film in a theater with other people. So they can feel what shared silence feels like, so they can be uncomfortable for a little while, make their peace with the silence, and then be rewarded for it. As a writer, one of the biggest obstacles I have had to overcome was learning not to avoid the silence, learning how to be peaceful in it, learning not to be restless in order to get the most out of myself. Modern movies are loud; they assault us with multiple layers of simultaneous sound. And I say that as someone who loves, adores even, sound in films. I listen to and appreciate and try to notice great soundwork in movies. I know the impact sound can have in telling a story. But too often in modern movies it feels like we are simply being bombarded by it, intimidated by it, manipulated with it, as though it’s a weapon instead of a tool. The wall of sound created in so many modern movies, I sometimes suspect, is being used to paper over deficiencies of plot and character, or to deflect us from noticing thin spots in the story, or the stacked improbabilities that would otherwise snap the band of suspended disbelief. Sometimes it feels like you’re watching a magician who confounds and confuses his audience with misdirections planted offstage in order to camouflage his bad magic. We aren’t given time to think, or enough quiet to think in, and I think that sometimes damages the experience. The Artist exposes this, and perhaps smart filmmakers will learn from it. Think about that amazing montage from the movie Up, that essentially tells the life story of Carl and Ellie. No words, no noise, no bludgeoning soundtrack. Just music and silent images. People still talk about that scene with almost religious devotion (maybe that’s just me). There is undeniable power in silence. You’ve probably noticed that I haven’t written at all about the movie itself, the story or the performances, some of which were fantastic. I don’t know how I feel about the movie as a story. I imagine the film will be nominated for Best Picture in a few weeks. As I mentioned earlier, I don’t know if The Artist is a great movie. I tend to think not. The story told by the movie hasn’t stuck with me in any substantial way. But I keep coming back to the idea that it was a powerful experience nonetheless. When you get down to it, isn’t one of the greatest accomplishments of a film its ability to transport us to a different place and time, and thoroughly immerse us in the experience? Isn’t that what we loved most about films like Avatar, and Saving Private Ryan? In that regard, this movie is an amazing achievement. I don’t know how else I could ever say that I possess some real sense of what it was like to go to the movies in the 1920’s. I’ve seen my share of silent movies, been deeply touched by Chaplin, and entertained by Lloyd, and studied Keaton. But I don’t know that I knew anything about the communal experience of a silent film, or how it differs from our experience. The ultimate achievement of this movie is its ability to rejuvenate that experience, and make us see how easy it was, a hundred years ago, to fall in love with those artificial, stilted films. Those quiet, untalking moving images that still managed somehow to say everything. Back when silence spoke volumes.